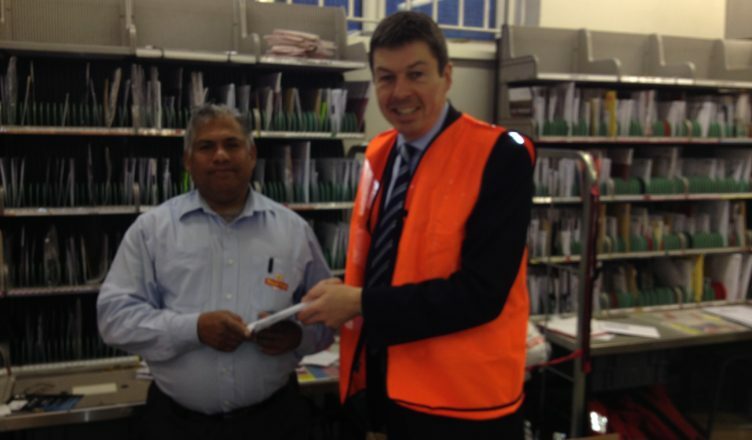 Ken visited the Clarkston Delivery Office to see first-hand the operation of delivering Christmas post and to pass on season’s greetings to its hard-working staff. He was shown around the office by Delivery Office Manager, Paul McBryan, and was introduced to the postmen and women, who are pulling out all the stops to sort and deliver mail in the Clarkston area over the Christmas period. Ken said: “This can be a busy and stressful time of year for many of us, not least our postmen and women. The mornings may be turning dark and cold, but we all still need our Christmas cards and online shopping delivered to the right people, in the right place at the right time. For more information about how to ensure your cards and gifts arrive on time, please visit the Royal Mail website or call 03457 740 740.